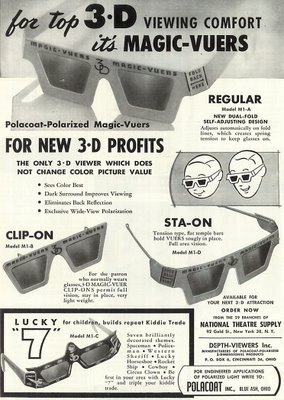 You had to wonder where some of those 3-D glasses had been when they were handing them out at theatre entrance doors back in 1953-54. A used Naturalvision viewing apparatus could be a hazardous thing. What if the previous user was some kid with lice in his/her hair, like Virginia Rappe (remember? ), or one of those nasty moppets that parked bubble gum behind the ear? Any number of nauseating possibilities arise when you consider the prospect of recycling Polaroid spectacles. "The Permanent Type" 3-D glasses were not to be given away. 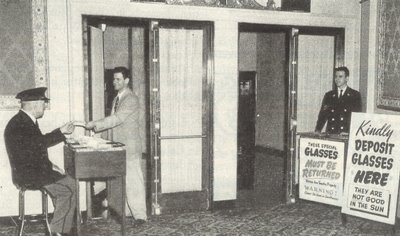 They didn’t come cheap, you see, and a theaterman could go broke in a hurry if he provided them gratis with each ticket --- so they had to be surrendered by audience members at the end of each show, as illustrated in this lobby display. 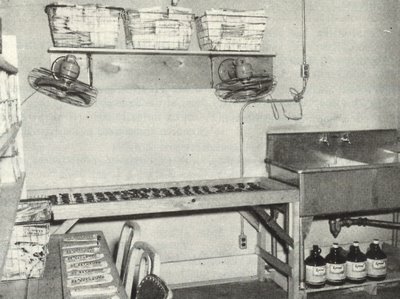 All of those used specs were then sterilized for ten minutes in a disinfecting solution, then dried on a wire rack below exhaust fans like the one you see here. Then it’s back downstairs to the lobby in individual envelopes for the next show (yeah, I can just imagine some of our local houses going to all that trouble for the sake of better hygiene). Patrons were advised to discard the envelopes in the auditorium (nice clean-up job for the custodial staff) and return the glasses as they were leaving. This was to circumvent souvenir hunters who might substitute something else in that envelope and make off with expensive glasses. Of course, some exhibitors simply increased admissions and passed the cost of the viewers along to the customers, assuring them of the "investment" advantage of owning glasses you could use for future 3-D shows. Any number of firms sold them in bulk to theatres. Here’s an ad featuring viewers with "spring tension" fold lines, and that "Lucky 7" kiddie model with rocket ship art would have gone nicely with a screening of Cat Women Of The Moon. My physical science professor at North Greenville College in Tigerville, South Carolina, noted my passion for stereo photography when I was a student there in the early 1990s. He told me he had been a theater usher at the Carolina Theater in Greenville back in '53 and '54, and had actually used what he called an "ozone machine" to disinfect 3-D glasses. I had every reason to believe him when he said the smell of ozone in the air after a thunderstorm always reminded him of 3-D movies.